What is the best time to photograph when you visit a location? When is the Golden Hour? When is the Blue Hour? What's the direction of sun and moon? Do we have full moon today? 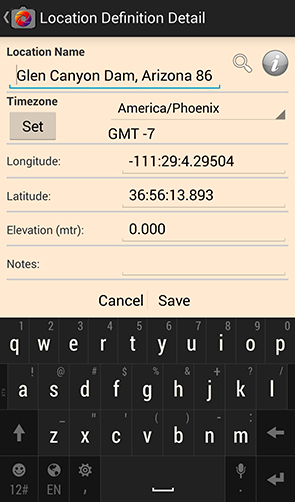 This tutorial shows you step by step how to find a location and calculate ephemeris data for sun and moon, and also twilight times using Photoxor C1. Note: For this search you need an Internet connection, so best prepare at home! 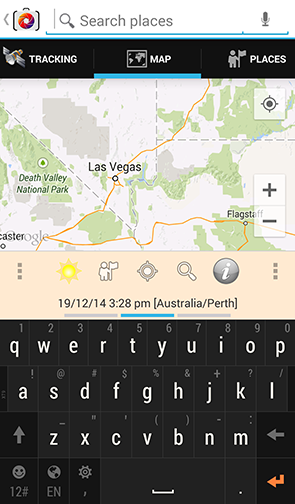 The Search icon is available on both the Map and Ephemeris screens. You can use either of them to begin a location search. When you press this button a little search text entry opens on top of the screen. Now start entering the name of the location, in our case glen cany. 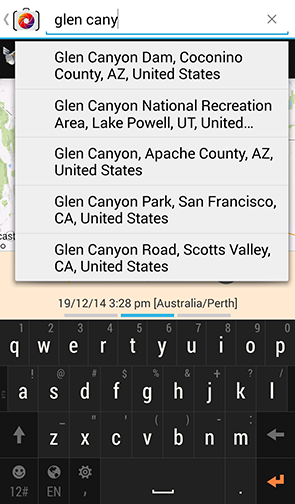 While you type, a list of matching location names is shown. Once the correct place appears in the list, click on it. A flag style marker is presented on the map to identify the location. Now click on this marker to see further options. 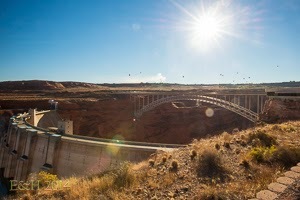 A dialog opens showing the name of the found location, in our case Glen Canyon Dam, Arizona, 86040, USA. If you prepare your travel you might now want to add this place to your list of locations for future quick access, even without Internet connectivity. To do this press Add. 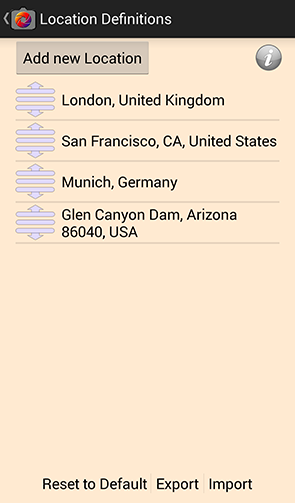 The location definition screen is brought up and pre-populated with our location. You might like to modify the name of the location or add some notes. Normally the correct timezone is set automatically. In some circumstances you need to manually change for daylight saving adjustment. Now press Save and you are back to the map screen. Your location is now stored for future use. What are the sun and moon directions for this location? Press the flag marker again to bring up the dialog and click on Current. Now the ephemeris calculations are done for this place. 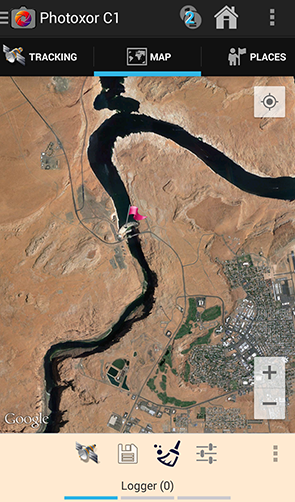 The flag marker changes to a blue pin noting the 'current location' for the purpose of the calculations. Sun and moon directions are shown. The lines with the sun and moon icons indicate the direction at the set date and time. The other lines represent rise and set directions that day. 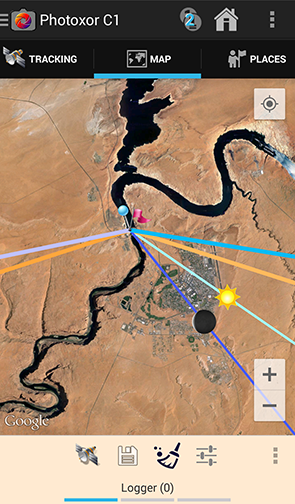 To get more details move to the Ephemeris screen; just use the tab slider above the map. 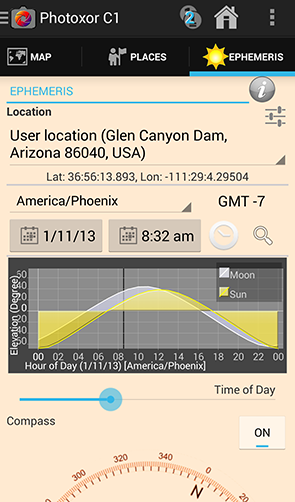 The Ephemeris screen now allows you to set date and time of your planned visit. Or just press the 'now' icon next to the date and time buttons if you are already there. Scroll a bit down and get a compass rose with directions. The movement of sun and moon is indicated. 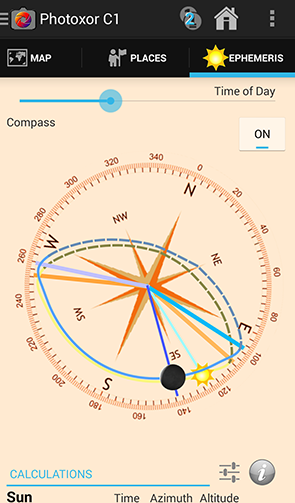 Move the time slider just above the compass rose to see how sun and moon positions change throughout the day. In case you prefer different colors for the direction lines, just press the Settings icon below the compass rose and change to you personal values. Scroll down further to see all details. 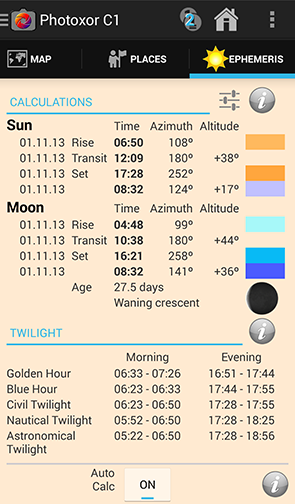 Here you also find the twilight times with Golden Hour and Blue Hour. Now you are ready to take these settings with you. 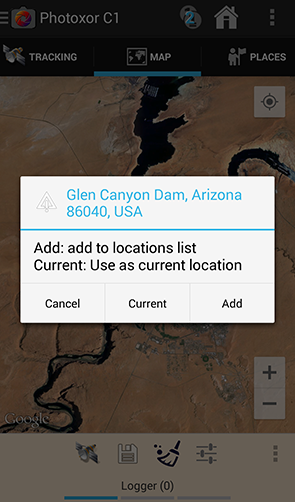 The Glen Canyon Dam location is stored in your location definitions list for quick and easy access in future. Use the Export button to save your important locations to a file.